Sport Ireland says it is "seeking urgent clarification" from the Football Association of Ireland about a loan given to the organisation by its Chief Executive. 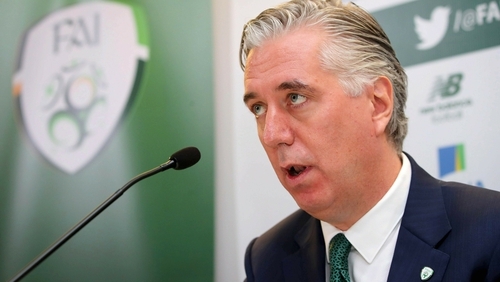 The agency says it has written to the President of the FAI asking for the Board of the association to "clarify the media reports concerning a loan" from John Delaney, "including the circumstances of the loan and its repayment." The agency, which oversees the development of sport in Ireland, says "it was not notified at any stage in 2017 about any apparent material deterioration in the FAI's financial position, as per Sport Ireland's Terms and Conditions of Grant Approval, and has sought additional clarification in relation to this matter." It comes after John Delaney confirmed in recent days that he had provided the FAI with a €100,000 bridging loan in April 2017. He said he "acted in the best interests of the association at a time when immediate funding was needed" during what he described as a "short-term cash flow issue" experienced by the FAI. The FAI said the money was repaid in full to its Chief Executive two months later in June 2017. In a statement, the Football Association of Ireland said it had received correspondence from Sport Ireland CEO John Treacy on behalf of Minister for Transport, Tourism and Sport Shane Ross. The Minister for Transport, Tourism and Sport Shane Ross said he asked Sport Ireland to contact the FAI Board to request a report on the circumstances of the loan in question. The Minister and Minister of State say they have noted some media reports and the statement of the FAI in respect of a €100,000 loan to the FAI from its Chief Executive John Delaney. A statement on the issue read: "This is a matter for the FAI's Board and auditors to clarify. Sport Ireland has been assured by the FAI's auditors that public funds are allocated by the FAI to the intended programmes."